- Power Rating 24 VDC. - Display dimensions 3.7", 5.7", 6.5", 10.4" & 15". 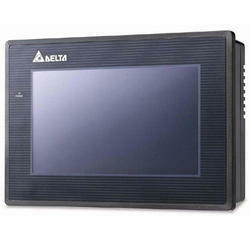 We are supplying complete range of HMI of Delta Makes. Our firm is ranked amongst the reputed names in the market for offering an extensive range of Human Machine Interface. Besides, we present this series to our clients at nominal prices. We are a unique name in the market to provide our respected customers an exclusive range of Human Machine Interface. The robust TFT, color touch LCD gives excellent visibility and features long-life (50, 000 hours) LED backlighting. Screen sizes range from 3.5 to 10 inches. Common Programming software for the entire FlexiPanels family...FREE!! We are engrossed in providing a finest class Siemens HMI Panel to the prestigious clients at very inexpensive price.